The Bank of Marada has just announced that it has lowered its interest rates to 0% and has therefore stopped giving out daily interest. Credit markets have been going into freefall and the Stock Market has totally collapsed with no sign of any immediate rebound. In the latest outlook on the Maradan economy, analysts predict a deepening recession that will affect the rest of Marada if the City doesn't do anything about it soon! In other news, the Post Office is the latest shop in the City to declare bankruptcy, with Stamps currently no longer restocking. Sorry for the unexpected, unplanned downtime we have had for most of the day. One of our routers died and had to be replaced. This closed off about a quarter of the site and we found it necessary to simply close the site until it returned. Its the first major downtime we have had all year and we hope that it doesn't happen again. Thanks for your patience and understanding! With the recent bankruptcy of Trevor's Car Parts store in the City of Marada, the Maradan Bank has been reviewing some of the bad loans it has been providing to Maradan companies. 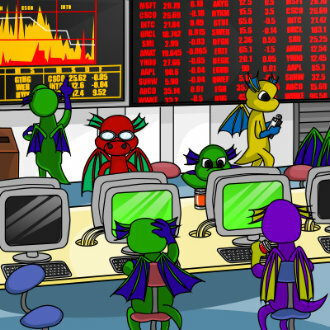 News quickly spread to Puchalla Village where panic selling of shares has reached the Maradan Stock Market. The Stock Market has now collapsed, with shares in all companies down and selling at -1,000MP per share! Shares in Car Parts are down -1070.9%! A new, very special Thanksgiving themed account upgrade has just been released in time for US Thanksgiving celebrations. This is a one-off celebration as the majority of the site do not celebrate it. This Account Upgrade will *RETIRE* in only 2 weeks on Dec 2nd!! It is a very unique upgrade pack as the main prize is a Restricted Pet Gobble. You will receive a thanksgiving themed cd, book, dvd, pearl, costume, stamp, minipet and random colour of a Gobble Potion. The Gobble pet will only ever be avaliable from these Account Upgrades. It is restricted and therefore cannot be gained from any other Temple or event. You literally only have these 2 weeks to get hold of one as it will not be in Account Upgrades again any time soon! With the fuel prices increasing this year, more and more Maradans have been leaving their cars at home and using more public transport or walking - some have even taken Elger's advice and have been travelling on the more fuel efficient Broomsticks! The fall in car sales has started to hit Trevor recently and today he has declared bankruptcy. Until he can afford to pay his creditors at the Maradan Bank, he has been forced to close his Car Parts Shop. The Lottery has been drawn for this week. clayplay is the winner of the 279,400MP Jackpot with the winning numbers of 25, 24, 23, 22, 21 and 1! Congratulations! Last Week's Raffle has now ended. NikkiWlee is the winner of the Red DNA and 100,000MP prize with the winning raffle ticket number 3322! Congratulations! Make sure you buy your tickets for today's raffle - only 10MP per ticket! Who likes this cute new Pilgrim Costume? Introducing our 62nd species of Marapet. The Gobble is a restricted pet and will be released as part of a new Thanksgiving Account Upgrade for November - it will never be released in Account Upgrades again! This ancient Temple has been opened for you to explore. Its very dangerous, so you can only send in one pet at a time and while the pet is inside the temple, you cannot trade or exchange the pet. Make sure you are prepared - the temple has many obstacles, 30 levels some say, but not many have made it all the way to the treasure deep inside! While inside the temple, your pet will notice many closed, locked doors which can only be opened by the earthly wisdom an Organic Minipet holds. The new Temple of Transvaluation has been added to the Lost City of Simeria map. The Lottery has been drawn for this week. noaman is the winner of the 96,300MP Jackpot with the winning numbers of 13, 16, 25, 21, 11 and 7! Congratulations! Last Week's Raffle has now ended. gege1212 is the winner of the Red DNA and 100,000MP prize with the winning raffle ticket number 5097! Congratulations! Make sure you buy your tickets for today's raffle - only 10MP per ticket! All Halloween Events will end on November 10th. This includes the character costumes currently on sale in the Account Upgrades! That means you only have 4 days remaining to find these Hidden Avatars!! The new Sleepy Battle Upgrade has just been released. A new type of Account Upgrades, they are priced at ? ?6 UK Pounds and are battle related. PLEASE NOTE - the battle cards will not be activated for battle in the Arena until later today. Thanks for your patience. The Sleepy themed battle upgrade has a sword, shield, wand, 3 trading cards and a new themed booster. We finally have Gardens for our houses. Every home automatically comes with a plot of land outside which is your Garden. The bigger the home, the bigger the Garden. You can plant Seeds in the garden and they will need to be watered with Pottery items you have filled with water at the Lush Lake. If you water a plant when it doesn't need watering it will die. If you water it when it needs watering, eventually it will grow into a Flower. You can then turn that flower into a new Organic Minipet if you have a Fertiliser item! Do you have a Minipet Pet? All Minipet costumed pets will receive FREE training at the Gym and School until November 7th. There are 7 new Hidden Avatars for you to find. The October 2010 Monthly Checklist winners have been announced and the prizes have been rewarded. Congratulations to all of those who have won. Don't forget, this is a monthly permanent feature that you can enter for FREE. If you haven't already, you should enter the November event! The Lottery has been drawn for this week. Hikarichaan is the winner of the 107,000MP Jackpot with the winning numbers of 11, 12, 13, 14, 25 and 16! Congratulations! Last Week's Raffle has now ended. ann222 is the winner of the Red DNA and 100,000MP prize with the winning raffle ticket number 4652! Congratulations! Make sure you buy your tickets for today's raffle - only 10MP per ticket! The final event of our Halloween Celebrations has just started. It will end on November 10th with all of our other halloween events. To take part in Character Trick or Treat, all you need to do is dress your character up in a Halloween Character Costume. Then you can visit the profile of any player that is currently online, hit the Trick or Treat button and get a prize! You can only Trick or Treat each person once and you will receive MP or an item. All of these item prizes will retire at the end of this event too! If you are dressed up really well for halloween, you might even scare the other player so bad that their character has to walk around the site looking terrified! You tricked Ian and look how scared they are!!! The Snowman has taken halloween a little too seriously again this year! 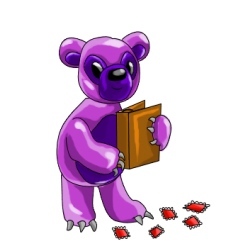 He is now only asking for halloween treats and he is giving out some new prizes! 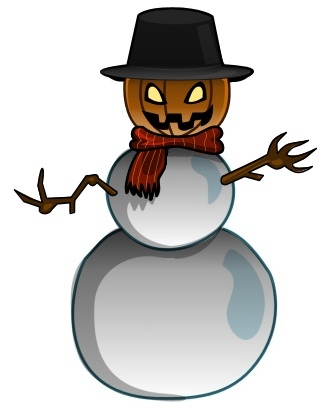 If you are very lucky, you may get a retired Halloween Snowman Character Costume!! For one week only, we are re-releasing some old Halloween Character Costumes in the Account Upgrades. You will receive the Male and the Female costume. From now until November 5th, all pets that are wearing Halloween, Nefarious, Skeleton, Ghost, Witch, Dark, Zombie, Wizard, Voodoo, Vampire, Goblin, Rotten, Midnight, Insideout, Gothic, Werewolf, Eleka, Killer or Devil costumes will receive DOUBLE STATS in the School, Gym and Elite Gym!! A new Pumpkin Hunt has just started for 2010! It will last 3 weeks. As you browse and play the site as normal, check out every page for a Pumpkin in a box. When you find it, click it and you'll get a prize! The 250 different players who collect the most pumpkins will receive 1,000,000MP and a limited edition Daemon Trading Card! The next 250 will just get a Daemon Trading Card. 10 lucky players who have collected more than 100 pumpkins will also be randomly selected to win a retired Halloween Costume!!! Its time to celebrate Halloween in the world of Undying Woods! Elger has taken the time off from doing quests during this holiday season. Instead, you can visit her with your pet dressed up for Halloween to go Trick or Treating for FREE once every 20 minutes - Werewolf pets can visit once every 15 minutes! All you need to take part is a pet wearing a Halloween, Nefarious, Skeleton, Ghost, Witch, Dark, Zombie, Wizard, Voodoo, Vampire, Goblin, Rotten, Midnight, Insideout, Gothic, Eleka, Killer, Werewolf or Devil costume! Its almost Halloween so we thought that we would let you know about all of the amazing Halloween Events are about to start and will end November 10th. Similar to last year's event, Elger will run a trick or treating event at her Haunted House. Anyone with at least one Halloween, Nefarious, Skeleton, Ghost, Witch, Dark, Zombie, Wizard, Voodoo, Vampire, Goblin, Rotten, Midnight, Insideout, Gothic, Eleka, Killer, Werewolf or Devil pet will be able to take part in this event for free. Similar to an event we have in the past, we will give you more information about this event when its released! The Snowman will be celebrating Halloween again this year too! The gym, elite gym and the school will give double stats to all pets that are Halloween, Nefarious, Skeleton, Ghost, Witch, Dark, Zombie, Wizard, Voodoo, Vampire, Goblin, Rotten, Midnight, Insideout, Gothic, Werewolf, Eleka, Killer or Devil coloured! As usual, there will be a few Halloween avatars especially for this event this year which you will not be able to receive again next year! Beelzebub is back and up to his old tricks again. Look out for him on the forums. He's collecting souls and he's after yours. You may receive a small gift from Beelzebub if he likes you but he can also be mean and play a trick on you! A new Werewolf themed account upgrade has just been released in time for Halloween. 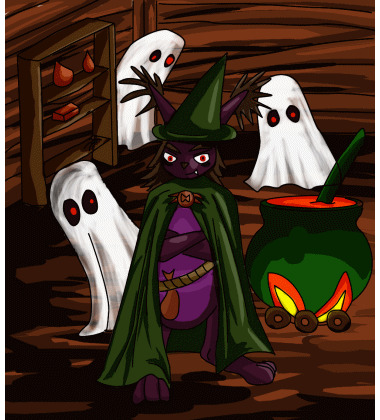 The werewolf pets will be included in the usual list of pet colours for the Halloween events. You will receive a werewolf themed cd, book, dvd, pearl, costume, stamp, minipet and either a Werewolf Tasi Potion or a Werewolf Knutt Potion. There is a 1 in 3 chance of you getting a limited edition Tasi! Halloween is almost here! The Halloween Events on Marapets are about to start, but here is a preview of the new Werewolf pets in the new halloween Account Upgrades! The Lottery has been drawn for this week. zaculu2000 is the winner of the 106,200MP Jackpot with the winning numbers of 25, 12, 3, 23, 7 and 16! Congratulations! Last Week's Raffle has now ended. MissGanja is the winner of the Red DNA and 100,000MP prize with the winning raffle ticket number 7328! Congratulations! Make sure you buy your tickets for today's raffle - only 10MP per ticket!